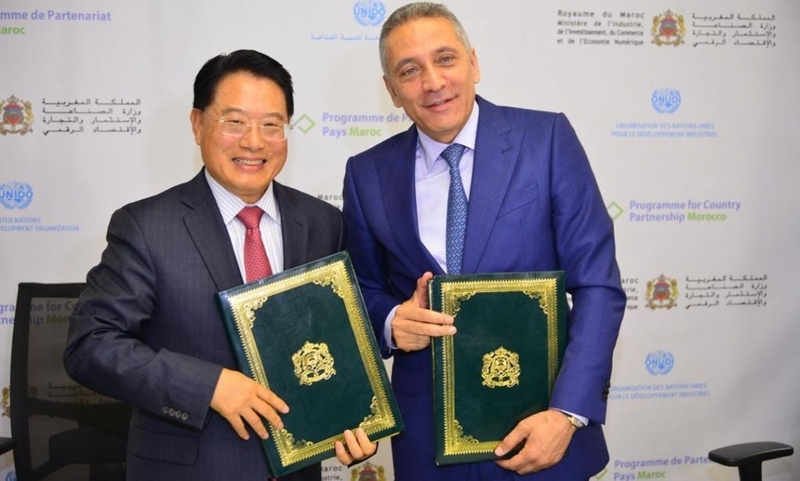 RABAT UNIDO Director General, LI Yong, has travelled to Morocco to open new avenues for collaboration between UNIDO and the Government of Morocco to promote inclusive and sustainable industrial development. To strengthen many years of successful cooperation between the Kingdom of Morocco and UNIDO, a Programme for Country Partnership has been signed by UNIDO's Li Yong and Morocco's Minister of Industry, Investment, Trade and Digital Economy, H.E. Moulay Hafid Elalamy. At the signing ceremony, Director General Li thanked the Minister for his active leadership and engagement with the establishment of the Programme for Country Partnership for Morocco. He has also commended “the Government for its industrial vision through its Industrial Acceleration Plan 2014-2021, which underlines the importance of public investment to guide industrial transformation and the achievement of a more dynamic manufacturing sector in the country. UNIDO believes that the Kingdom has a unique window of opportunity to create high and inclusive growth. We will endeavour to support the acceleration of an inclusive and sustainable industrial development that contributes to the Kingdom’s drive for increasing competitiveness." Li added that the ceremony marked an important milestone: the finalization of the PCP Morocco programming phase. He noted that the Government of the Kingdom of Morocco and UNIDO have been working closely together for a number of months to develop a comprehensive programme to unleash Morocco’s industrial potential. The PCP Morocco focuses on six priority components: industrial zones; agro-industry; energy efficiency; the circular economy; the fourth industrial revolution; and e-commerce, supported by cross-cutting components, namely: South-South and triangular industrial cooperation; multi-stakeholder partnerships; gender mainstreaming; and industrial statistics. The PCP will rest on a multi-stakeholder partnership led by the Moroccan Government. It builds synergies with ongoing government and partner interventions relevant to industrial development and has been designed to leverage additional investments in selected priority sectors. As such, it will be a model that facilitates the mobilization of partners and resources to achieve higher development impact in the country. On behalf of the Government of Morocco, H.E. Moulay Hafid Elalamy thanked the UNIDO Director General for his strong involvement in the entire process of developing the PCP and congratulated his team for the work done during the programming phase. He further stressed his appreciation for the design of the PCP in close consultation and coordination with the various ministerial departments concerned, the private sector and all additional stakeholders, ultimately contributing to the objectives of national strategies, particularly in the fields of agriculture, energy, environment and vocational training. As a next step, the two partners will implement a portfolio of technical cooperation projects in the above areas of focus through voluntary contributions of the Moroccan Government and different UNIDO member states, as well as additional financial support provided by other donors and development institutions. The signing ceremony wasfollowed by meetings with the highest representatives of the Government of Morocco, namely with the Head of Government, H.E. Saad Eddine El Othmani, and with the Minister of Foreign Affairs and International Cooperation, H.E. M Nasser Bourita.